The design world is filled with out-of-the-box thinking, artistry, creativity, and rapid moving parts. For designers, the end result of a project is what makes or breaks you. There’s no point of creating a stunning visual if it’s not delivered in a manner that is reflective of the countless hours of work behind it! Every detail is important: image quality, paper handling, and the colour balance, to name a few. As a designer, you should be able to hone your focus on what truly matters, not whether your printer is doing a “good enough” job. To ensure you find the design printer of your dreams, we’ve highlighted our top three contenders that will indubitably enhance your creativity. Canon is globally recognized for its innovative thinking and technology, and the case is no different when it comes to their printing products. If you’re looking for an all-in-one printer with impressive user-friendliness, the Imageclass MF33CDW is a fantastic option. The Imageclass MF33CDW is ideal for small design businesses focusing on print (paper) media. The printer is wireless, easily connectable to mobile devices and features a simple touchscreen interface. For designers that use apps like procreate to design on the go, the Imageclass has Apple Airprint conveniently enabled as well. The printer also offers the economical feature of four separate print cartridges, and they only require replacement once the ink runs out. To get the best prints possible, it’s good practice to find compatible cartridges for the Canon brand. Additionally, the MF33CDW includes a USB port for you to print off what you need directly. One of the design printer’s best features is its high quality output, especially for images. Although there has always been a battle between laser and inkjet systems, laser printers are great for producing large quantities with great speed. This printer places priority on outstanding colour–perfect for brochures, posters, pamphlets and booklets. You won’t have to worry about delayed prints or paper jams as this printer has an output of up to 28 pages per minute (with the first print out in just nine seconds or less!). Ultimately, we believe this is one of the best user-friendly design printers on the market–it was clearly created with a wide range of consumers and their needs in mind. Canon’s Maxify MB5420 is another fabulous printer for those that have a limited budget and are design-focussed. 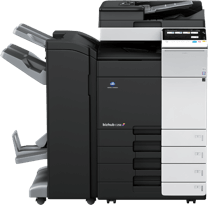 The machine is designed to operate as an all-in-one, and is perfect for small to midsize offices. If you’re looking for something that can handle heavy usage, this is the printer for you. It features two paper trays (because one is never enough!) that can hold up to 500 sheets of paper. The page-per-minute rate of this small but powerful design printer is impressive, printing 20 pages in a minute on average. When it comes down to print quality, the Maxify MB5420 has proven to be a worthy competitor to other inkjet printers, or even laser printers. The area in which the printer shines (literally) is its consistent glossy finish. The design printer is compatible with envelopes, plain paper, labels, matte paper, cards, glossy photo paper, luster paper and high resolution paper. The results are always the same: gorgeous finishes, well-saturated dark colours, image sharpness, and no colour bleeding. The smoothness in textures were impressive as well. The ink costs are compatible with similar printers, and can be more cost-effective if you purchase multipacks. One of the printer’s biggest features is that it offers two-sided printing, great for booklets or presentation decks. If you’re an in-house designer developing branded print content for a small business, this printer is ideal! Konica Minolta has separated themselves from the pack when it comes to innovative technology and design-focussed products. They recently released an “Extreme Digital Designer’s Guide to Showcase Digital Printing and Finishing Technologies”. The guide analyzes hot trends like textured foil and varnish printing, and other features that are all-things-designer. On top of creating a guide, they’ve also developed top of the line printers that are a dream for designers. This beast of a printer delivers results that are just as big. 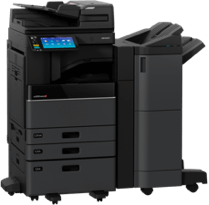 The Accuriopress C6085 is a great fit for mid to large sized firms looking to print high quantities with high quality. This Konica Minolta product is a production printer, perfect for digital printing. Some of its key features include a 1,530,000 sheet monthly duty cycle, automated closed-loop quality management system, 13,890 sheet paper capacity, and 885 page-per-minute colour output! The design printer also features several accessories, including a saddle stitch unit that can produce gorgeous booklets with face trimming. It also saves you the hassle of manually stapling pages with its staple finisher (of up to 100-sheet stapling!). If you’re looking to print large design items like posters or banners, this printer will get the job done with an impeccable finish. Whether you’re an aspiring designer just getting into the game, or a seasoned professional working for big clients, the quality of your work is what matters most! Try to analyze your needs, what features are non-negotiable to you, and go from there in deciding what design printer will make the best fit. Here at Business Systems, we aim to provide our consumers with several options that will fit your criteria and make your days in the office a little bit easier! If you’re interested in one of the products we’ve listed above, contact us for a quote! Comment below and let us know what design features appeal to you the most!